Another Roulette game, this time with a Japanese theme. The Straight Bet - This is a bet on any single number and odds of 35-1 are paid on a winning number. winning bet. If 0 comes up, the column bets lose. numbers 13 to 24 and/or numbers 25 to 36. The odds are 2-1 for a winning bet. If 0 comes up the dozens bets lose. the odd and even bets lose. winning bet. If 0 comes up the high and low bets lose. those two numbers will come up. The odds are 17-1.
row. The bet is that one of the three numbers will come up. The odds are 11-1.
up. The odds are 8-1 for a winning number. The Six Number Bet - This bet is placed on the outside of the line that splits two rows of numbers. This will cover all six numbers. The bet is that one of the six numbers will come up. The odds here are 5-1 for a winning number. When you run short of money you can use button with $ image to add some more. 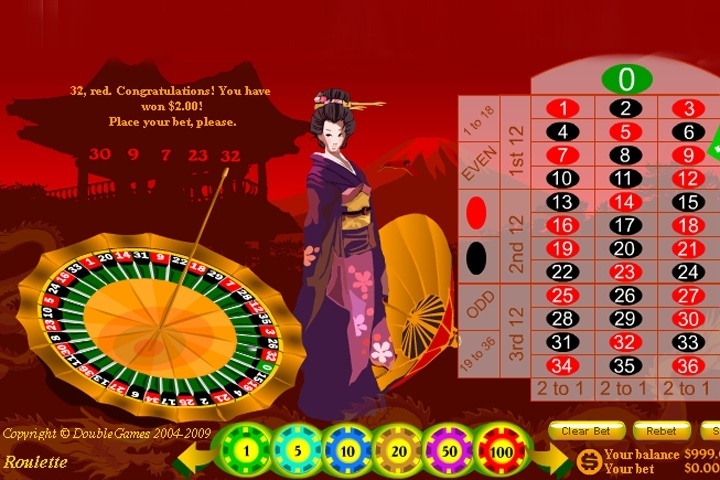 If you want to play Japanese Roulette games online you have come to the right place! GamesLoon adds new Japanese Roulette games every week. This is your game portal where you can find the biggest collection of free Japanese Roulette games online. Do not forget to rate our Japanese Roulette free online games while playing!